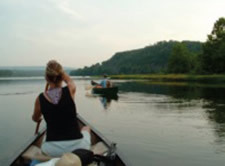 Price includes canoe rental and shuttle service from Susquehanna Outfitters (they gave us a special Yoga Rate :), Saturday night dinner and Sunday morning breakfast and other miscellaneous supplies . . .
6:30 Vegetarian Dinner and Camp Fire, explore the island, etc. Lunch for Saturday (and Sunday if you need it), Tent, sleeping bag, overnight supplies, water bottle, swim suits, fishing gear (if you have license), more info coming once registered.